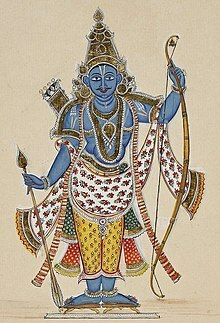 Rama (राम Rāma) is the seventh avatar of the Hindu god Vishnu, and a king of Ayodhya in Hindu scriptures. Rama is also the protagonist of the Hindu epic Ramayana, which narrates his supremacy. Commonly it is proposed that Rama was born about 1.2 million years ago, during the Treta Yuga age that lasted 1,296,000 years. Rama is one of the many popular figures and deities in Hinduism, specifically Vaishnavism and Vaishnava religious scriptures in South and Southeast Asia. Along with Krishna, Rama is considered to be one of the most important avatars of Vishnu. In a few Rama-centric sects, he is considered the Supreme Being, rather than an avatar. In sculpture, Rama is represented as a standing figure, holding an arrow in his right hand and a bow in his left.... - The Editors of Encyclopædia Britannica. Rama and Lakshmana before Jatayu - Jatayu, a divine bird, the king of the vultures. He was Sampati. According to Ramayana and Mahabharata, he was the son of Aruna and Shyeni. In the Ramayana he tried to prevent Ravana from carrying away Sita, but was wounded and killed. Rama and Lakshmana performed his last rites, and he ascended to heaven in a chariot of fire. Rama and Sita worship god Shiva at Rameshwaram as Vibhishana (right) looks on with Lakshamana, Tumburu and Narada - Say, for instance, 'My Rama, my Krishna.' If you must have pride, then feel like Vibhishana, who said, 'I have touched the feet of Rama with my head; I will not bow this head before anyone else. - Ramakrishna. Rama, one of the most widely worshipped Hindu deities, the embodiment of chivalry and virtue. Although there are three Ramas mentioned in Indian tradition (Parashurama, Balarama, and Ramacandra), the name is specifically associated with Ramacandra, the seventh incarnation (avatara) of Lord Vishnu. It is possible that Rama was an actual historical figure, a tribal hero of ancient India who was later deified. His story is told briefly in the Mahabharata (“Great Epic of the Bharata Dynasty”) and at great length in the Ramayana (“Journey of Rama”). References to Rama as an incarnation of Vishnu appear in the early centuries ce; there was, however, probably no special worship of him before the 11th century, and it was not until the 14th and 15th centuries that distinct sects appeared venerating him as the supreme god (notably that of the followers of the Brahman Ramananda). Rama’s popularity was increased greatly by the retelling of the Sanskrit epics in the vernaculars, such as Tulsidas’s celebrated Hindi version, the Ramcharitmanas (“Sacred Lake of the Acts of Rama”). The Editors of Encyclopædia Britannica in: "Rama Rama, Alternate title: Rāmacandra"
Rama and Krishna (also an incarnation of Vishnu) were the two most popular recipients of adoration from the bhakti (devotional) cults that swept the country during that time. Whereas Krishna is adored for his mischievous pranks and amorous dalliances, Rama is conceived as a model of reason, right action, and desirable virtues. Temples to Rama faced by shrines to his monkey devotee Hanuman are widespread throughout India. Rama’s name is a popular form of greeting among friends (“Ram! Ram!”), and Rama is the deity most invoked at death. In sculpture, Rama is represented as a standing figure, holding an arrow in his right hand and a bow in his left. His image in a shrine or temple is almost invariably attended by figures of his wife, Sita, his favourite half-brother, Lakshmana, and his monkey devotee, Hanuman. In painting, he is depicted dark in colour (indicating his affinity with Lord Vishnu), with princely adornments and the kirita-makuta (tall conical cap) on his head indicating his royal status. Rama’s exploits were depicted with great sympathy by the Rajasthani and Pahari schools of painting in the 17th and 18th centuries. ...In north India the festival [Divali] celebrates the return of Rama, Sita, Lakshmana, and Hanuman to the city of Ayodhya, where Rama’s rule of righteousness would commence. Jatayu, a divine bird, the king of the vultures. He was Sampati. According to Ramayana and Mahabharata, he was the son of Aruna and Shyeni. In the Ramayana he tried to prevent Ravana from carrying away Sita, but was wounded and killed. Rama and Lakshmana performed his last rites, and he ascended to heaven in a chariot of fire. Roshen Dalal in: Hinduism: An Alphabetical Guide, Penguin UK, 18 April 2014, p. 572. Do not get spoiled believing this mendacity. And get rid of the fear of the evils all. This is an allegorical song in which Dasa refers to the nine openings of the body to the city and the five kings relate to the five universal elements of fire, air, water, earth and space. Degradable wastes are within the body which all binds us to this world. And to seek salvation he advises to take the name of God. RĀMA, rä'mȧ: In Hindu mythology, the name of the sixth, seventh, and eighth incarnations of Vishnu, Parasurama, Ramacandra, and Balarama. Of these the Ramacandra avatar is by far the most famous, as Rama is here the hero of the Sanskrit epic of the Rāmāyaṇa. My Rama, the Rama of our prayers is not the historical Rama, the son of Dasharatha, the King of Ayodhya. He is the eternal, the unborn, the one without a second. Him alone I worship. His aid alone I see, and so should you. He belongs equally to all. I, therefore, see no reason why a Mussalman or anybody should object to taking His name. But he is in no way bound to recognize God as Ramanama. He may utter to himself Allah or Khuda so as not to mar the harmony of the sound. I myself have been a devotee of Tulsidas from my childhood and have, therefore, always worshipped God as Rama. But I know that if, beginning with Omkar, one goes through the entire gamut of God's names current in all climes, all countries and languages, the result is the same. He and His law are one. To observe His law is, therefore, the best form of worship. The Diwali holds an imperative meaning among the Hindus, since, the day is reckoned with Lord Rama’s coronation ceremony as the King of Ayodhya after his return to the kingdom from 14 years of exile along with his wife Sita and brother Lakshman. Be not afraid. This is poetry that is coming out of your mouth. Write the life of Rama in poetic language for the benefit of the world. And that is how the poem first began. The first verse sprang out of pity, from the mouth of Valmiki, the first poet. And it was after that he [Valmiki] wrote the beautiful Ramayana, the “Life of Rama”. Say, for instance, 'My Rama, my Krishna.' If you must have pride, then feel like Vibhishana, who said, 'I have touched the feet of Rama with my head; I will not bow this head before anyone else. The first major legendary reference to Sri Lanka is found in the great Indian epic, the Ramayana (Sacred Lake of the Deeds of Rama), which was written around 500 B.C. 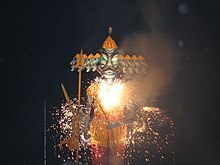 It refers to a conquest of Lanka in 3000 BC by Rama, to liberate his abducted wife, Sita, from Ravana, the demon god of Lanka.Many place names in Sri Lanka, very especially in and around Sri Lankan cities such as Galle, and Nuvara Eliya have close resemblance and relationship with this legendary. I call him Rama. You can call him by any other name but have faith in him, surrender all worldly desires and passions to his will and without effort, become disciplined and principled. The story of Ramachandra [Rama], as narrated in the Valmiki Ramayan and the Adhyatma Ramayan, after reinforcing and revitalizing it with the essence of whatever the Puranas, the Vedas, and other scriptures could give, I, Tulsidas, am writing for the delight of my own soul. The gracious, the essence of scripture, more pure, efficacious. Be a Courier of man? The Ramayana tells the story of the deeds of Lord Ram who, having devoted himself to fighting demons, defeats in a mighty war Ravan, the demon king of Lanka (present day Sri Lanka), who had kidnapped his wife Sita. You cannot count on the physical proximity of someone you love, all the time. A seed that [[w:Sprouts|sprouts at the foot of its parent tree remains stunted until it is transplanted. Rama will be in my care, and he will be quite well. But ultimately, he will leave me too. Every human being, when the time comes, has to depart to seek his fulfillment in his own way. Early during the period of exile, Bharata, the younger brother had come and informed Rama, of the death of the old king [Dasharatha] and vehemently insisted on his occupying the throne. During Rama's exile Bharata would on no account ascend the throne and out of respect placed a pair of Rama's wooden shoes on it as a substitute for his brother. Then Rama returned to his capital, and by the common consent of his people he became the king of Ayodhya. A few days after Sita's disappearance, a messenger came to Rama from the gods, who intimated to him that his mission on earth was finished and he was to return to heaven. These tidings brought to him the recognition of his own real Self. He plunged into the waters of Sarayu, the mighty river that laved his capital, and joined Sita in the other world. The oldest of the epics is called Ramayana, "The Life of Râma". There was some poetical literature before this — most of the Vedas, the sacred books of the Hindus, are written in a sort of metre — but this book is held by common consent in India as the very beginning of poetry. The name of the poet or sage was Vâlmiki. Later on, a great many poetical stories were fastened upon that ancient poet; and subsequently, it became a very general practice to attribute to his authorship very many verses that were not his. Notwithstanding all these interpolations, it comes down to us as a very beautiful arrangement, without equal in the literatures of the world. "Arise, O sage! "Thus aroused he exclaimed, "Sage? I am a robber!" "No more 'robber'," answered the voice, "a purified sage art thou. Thine old name is gone. But now, since thy meditation was so deep and great that thou didst not remark even the ant-hills which surrounded thee, henceforth, thy name shall be Valmiki — 'he that was born in the ant-hill'." So, he became a sage...."Thou art a wretch," he cried, "without the smallest mercy! Thy slaying hand would not even stop for love!" "What is this? What am I saying?" the poet thought to himself, "I have never spoken in this sort of way before." And then a voice came: "Be not afraid. This is poetry that is coming out of your mouth. Write the life of Rama in poetic language for the benefit of the world." And that is how the poem first began. The first verse sprang out of pits from the mouth of Valmiki, the first poet. And it was after that, that he wrote the beautiful Ramayana, "The Life of Rama". After Valmiki was enlightened, he saw a hunter killing one of the doves kissing in the Ganges River which touched him and he then cried "Thou art a wretch". There was an ancient Indian town called Ayodhyâ... There, in ancient times, reigned a king called Dasharatha. He had three queens, but the king had not any children by them. And like good Hindus, the king and the queens, all went on pilgrimages fasting and praying, that they might have children and, in good time, four sons were born. The eldest of them was Rama....Now, as it should be, these four brothers were thoroughly educated in all branches of learning. To avoid future quarrels there was in ancient India a custom for the king in his own lifetime to nominate his eldest son as his successor, the Yuvarâja, young king, as he is called. Now, there was another king, called Janaka, and this king had a beautiful daughter named Sitâ. Sita was found in a field; she was a daughter of the Earth, and was born without parents....When she was of a marriageable age, the king wanted to find a suitable husband for her...There was an ancient Indian custom called Svayamvara, by which the princesses used to choose husbands....There were numbers of princes who aspired for the hand of Sita; the test demanded on this occasion was the breaking of a huge bow, called Haradhanu. All the princes put forth all their strength to accomplish this feat, but failed. Finally, Rama took the mighty bow in his hands and with easy grace broke it in twain. Thus Sita selected Rama, the son of King Dasharatha for her husband, and they were wedded with great rejoicings. Then, Rama took his bride to his home, and his old father thought that the time was now come for him to retire and appoint Rama as Yuvaraja. Everything was accordingly made ready for the ceremony, and the whole country was jubilant over the affair, when the younger queen Kaikeyi was reminded by one of her maidservants of two promises made to her by the king long ago...the servant suggested to her to ask from the king the two promised boons: one would be that her own son Bharata should be placed on the throne, and the other, that Rama should be sent to the forest and be exiled for fourteen years. Rama was the life and soul of the old king and when this wicked request was made to him, he as a king felt he could not go back on his word. So he did not know what to do. But Rama came to the rescue and willingly offered to give up the throne and go into exile, so that his father might not be guilty of falsehood. So Rama went into exile for fourteen years, accompanied by his loving wife Sita and his devoted brother Lakshmana, who would on no account be parted from him. Wherever Rama goes, there goes Sita. How can you talk of 'princess' and 'royal birth' to me? I go before you!" Sita in reply to Rama’s exclaiming "How can you, a princess, face hardships and accompany me into a forest full of unknown dangers!" On the banks of the river they built little cottages, and Rama and Lakshmana used to hunt deer and collect fruits. After they had lived thus for some time, one day there came a demon giantess. She was the sister of the giant king of Lanka (Ceylon) [Ravana]. Roaming through the forest at will, she came across Rama, and seeing that he was a very handsome man, she fell in love with him at once. But Rama was the purest of men, and also he was a married man; so of course he could not return her love. In revenge, she went to her brother, the giant king, and told him all about the beautiful Sita, the wife of Rama. Rama was the most powerful of mortals; there were no giants or demons or anybody else strong enough to conquer him. So, the giant king had to resort to subterfuge. He got hold of another giant who was a magician and changed him into a beautiful golden deer; and the deer went prancing round about the place where Rama lived, until Sita was fascinated by its beauty and asked Rama to go and capture the deer for her. Rama went into the forest to catch the deer, leaving his brother in charge of Sita. Then Lakshmana laid a circle of fire round the cottage, and he said to Sita, "Today I see something may befall you; and, therefore, I tell you not to go outside of this magic circle. Some danger may befall you if you do." In the meanwhile, Rama had pierced the magic deer with his arrow, and immediately the deer, changed into the form of a man, died. ...the giant king [Ravana], who had taken the form of a mendicant monk, stood at the gate and asked for alms. "Wait awhile," said Sita, "until my husband comes back and I will give you plentiful alms." "I cannot wait, good lady," said he, "I am very hungry, give me anything you have."... But the mendicant monk after many persuasions prevailed upon her to bring the alms to him, assuring her that she need have no fear as he was a holy person. So Sita came out of the magic circle, and immediately the seeming monk assumed his giant body, and grasping Sita in his arms he called his magic [[w:Chariot|chariot, and putting her therein, he fled with the weeping Sita. Poor Sita! She was utterly helpless, nobody, was there to come to her aid. As the giant was carrying her away, she took off a few of the ornaments from her arms and at intervals dropped them to the grounds. When Rama and Lakshmana returned to the cottage and found that Sita was not there, their grief knew no bounds.... After long searching, they came across a group of "monkeys", and in the midst of them was Hanumân, the "divine monkey". Hanuman, the best of the monkeys, became the most faithful servant of Rama and helped him in rescuing Sita. His devotion to Rama was so great that he is still worshipped by the Hindus as the ideal of a true servant of the Lord...the "monkeys" and "demons" are meant the aborigines of South India. So, Rama, at last, fell in with these monkeys. They told him that they had seen flying through the sky a chariot, in which was seated a demon who was carrying away a most beautiful lady, and that she was weeping bitterly, and as the chariot passed over their heads she dropped one of her ornaments to attract their attention. Then they showed Rama the ornament....the monkeys told Rama who this demon king was and where he lived, and then they all went to seek for him. ...the monkey-king Vâli and his younger brother Sugriva were then fighting amongst themselves for the kingdom. The younger brother was helped by Rama, and he regained the kingdom from Vali, who had driven him away; and he, in return, promised to help Rama. They searched the country all round, but could not find Sita. At last Hanuman leaped by one bound from the coast of India to the island of Ceylon, and there went looking all over Lanka for Sita, but nowhere could he find her....he found Sita under a tree, pale and thin, like the new moon that lies low in the horizon....Hanuman came nearer to Sita and told her how he became the messenger of Rama, who had sent him to find out where Sita was; and Hanuman showed to Sita the signet ring which Rama had given as a token for establishing his identity....she gave him a jewel from her hair to carry to Rama; and with that Hanuman returned. Learning everything about Sita from Hanuman, Rama collected an army, and with it marched towards the southernmost point of India. 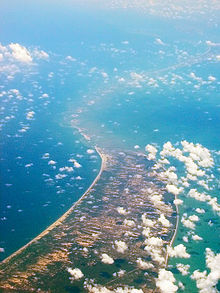 There Rama's monkeys built a huge bridge, called Setu-Bandha, connecting India with Ceylon. In very low water even now it is possible to cross from India to Ceylon over the sand-banks there....Rama was God incarnate, otherwise, how could he have done all these things? He was an Incarnation of God, according to the Hindus.... believes him to be the seventh Incarnation of God. The monkeys removed whole hills, placed them in the sea and covered them with stones and trees, thus making a huge embankment. A little squirrel, so it is said, was there rolling himself in the sand and running backwards and forwards on to the bridge and shaking himself. Thus in his small way he was working for the bridge of Rama by putting in sand.... Rama saw it and remarked: "Blessed be the little squirrel; he is doing his work to the best of his ability, and he is therefore quite as great as the greatest of you." Then he gently stroked the squirrel on the back, and the marks of Rama's fingers, running lengthwise, are seen on the squirrel's back to this day. ...when the bridge was finished, the whole army of monkeys, led by Rama and his brother entered Ceylon. For several months afterwards tremendous war and bloodshed followed. At last, this demon king, Ravana, was conquered and killed; and his capital, with all the palaces and everything, which were entirely of solid gold, was taken.... all these golden cities fell into the hands of Rama, who gave them over to Vibhishana, the younger brother of Ravana, and seated him on the throne in the place of his brother, as a return for the valuable services rendered by him to Rama during the war. Rama passed a few years in happiness with Sita, when the people again began to murmur that Sita had been stolen by a demon and carried across the ocean. They were not satisfied with the former test and clamoured for another test, otherwise she must be banished. In order to satisfy the demands of the people, Sita was banished, and left to live in the forest, where was the hermitage of the sage and poet Valmiki. The sage found poor Sita weeping and forlorn, and hearing her sad story, sheltered her in his Âshrama. Sita was expecting soon to become a mother, and she gave birth to twin boys. The poet never told the children who they were. He brought them up together in the Brahmachârin life. He then composed the poem known as Ramayana, set it to music, and dramatised it. Valmiki dramatised "The Life of Rama", and taught Rama's two children how to recite and sing it. There came a time when Rama was going to perform a huge sacrifice, or Yajna, such as the old kings used to celebrate....Now Rama's wife was not with him then, as she had been banished. So, the people asked him to marry again. But at this request Rama for the first time in his life stood against the people. He said, "This cannot be. My life is Sita's." So, as a substitute, a golden statue of Sita was made, in order that the; ceremony could be accomplished. They arranged even a dramatic entertainment, to enhance the religious feeling in this great festival. Valmiki, the great sage-poet, came with his pupils, Lava and Kusha, the unknown sons of Rama....Under the direction of Valmiki, the life of Rama was sung by Lava and Kusha, who fascinated the whole assembly by their charming voice and appearance. Poor Rama was nearly maddened, and when in the drama, the scene of Sita's exile came about, he did not know what to do. Then the sage said to him, "Do not be grieved, for I will show you Sita." Then Sita was brought upon the stage and Rama delighted to see his wife. ...the old murmur arose: "The test! The test!" Poor Sita was so terribly overcome by the repeated cruel slight on her reputation that it was more than she could bear. She appealed to the gods to testify to her innocence, when the Earth opened and Sita exclaimed, "Here is the test", and vanished into the bosom of the Earth. The people were taken aback at this tragic end. 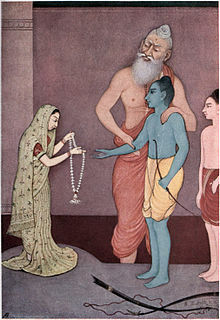 And Rama was overwhelmed with grief. Tulsidas, the poet author of Ramacharitamanas. Mount Meru in Hindu mythology - Before the strong wind that could uproot Mount Meru, of what account is such a mere flock of cotton as I am? When I think of Rama's infinite majesty I tremble as I write. - Tulsidas. Rama and Lakshmana confer with Sugriva - Thus the very crime for which he like a huntsman killed Bali, was in turn the sin of Sugriva, and again of Vibhishan; but in their case Rama did not dream of censure, but honoured them both at the meeting with Bharat and commended them in open in court. Instruct me, my lord, with regard to him who is the passionless, all-pervading, omnipresent god. Be not wroth at my ignorance, but take steps to remove it. In the wood, though I was too awe-stricken to tell you, I beheld the majesty of Rama, yet my mind was so dull that I did not understand, and I reaped a just reward. They grow up, and the king is thinking where to find suitable brides for them, when Visvamitra comes, and after a long colloquy takes away with him Rama and Lakshmana to protect him at the time of sacrifice from the demons that persistently assail him. ...Abandoning a spot which Rama had made so peculiarly his own; of the thieves who were prevented from breaking into the poet's [Tulsidas] house by Rama himself acting as watchman; of his visit to Brindaban and his interview with Nabhti Ji, and of his persistence in preferring the worship of Rama to that of Krishna, though the latter assured him in person that there was no difference between the two - all these legends as given in the Bhakta-Mala, whatever their foundation, are still popularly accepted as verities and are in dissolubly connected with the poet’s name. With this having purified the eyes of my understanding, I proceed to relate the actions of Rama, the redeemer of the world. First I reverence the feet of the great Brahman saints, potent to remove the doubts engendered by error. The most elegant composition of the most talented poet has no real beauty if the name of Rama is not in it; in the same way as a lovely woman adorned with the richest jewels is vile if unclothed. But the most worthless production of the feeblest versifier, if adorned with the name of Rama, is heard and repeated with reverence by the wise; like bees gathering honey; though the poetry has not a single merit, the glory of Rama is manifested in it. Before the strong wind that could uproot Mount Meru, of what account is such a mere flock of cotton as I am? When I think of Rama's infinite majesty I tremble as I write. Whoever in a devout spirit, with intelligence and attention, hears or repeats this lay of mine, he shall become full of true love for Rama, and cleansed from worldly stains shall enjoy heavenly felicity. Thus there are in the world four kinds of Rama-worshippers, all four good, holy, and beneficent; but of these four sages who trust in the name they are the most dear to the lord who understand his mysteries. His name is great in the four Vedas and in the four ages of the world, but in this fourth age [Kali Yuga] especially there is no other hope. Rama assembled a host of bears and monkeys and had no little trouble to build his bridge; his name can dry up the ocean of life; meditate thereon, 0 ye faithful. Rama killed in battle Ravan and all his family and returned with Sita in his own city, a king to Avadh his capital, while gods and saints hymned his praises, but his servants, if only they affectionately meditate on his name, vanquish with ease the whole army of error, and move, absorbed in interior ecstasy, without even a dream of sorrow. As Narsinh was manifested to destroy the enemy of heaven, Hiranyakasipu, and protect Prahlad, so is Rama's name for the destruction of the world and the protection of the pious. By repeating this name, whether in joy or in repose, bliss is diffused all around. Thus the very crime for which he like a huntsman killed Bali, was in turn the sin of Sugriva, and again of Vibhishan; but in their case Rama did not dream of censure, but honoured them both at the meeting with Bharat and commended them in open in court. The heart is as it were a deep place in a land of good thoughts, the Vedas and Puranas are the sea, and saints are as clouds, which rain down praises of Rama in sweet, grateful, and auspicious showers; the sportive actions related of him are like the inherent purity and cleansing power of rain-water, while devotion is beyond the power of words to describe is its sweetness and coolness. The story of the marriage of Shiva with the daughter of the snowy mountains is like the winter; the glad rejoicings at the Lord's birth are like the dewy season; the account of the preparations for Rama's wedding are like the delightful and auspicious spring; Rama’s intolerable banishment is like the hot weather, and the story of his journeyings like the blazing sun and the wind; his encounters with fierce demons, by which he gladdens the hosts of heaven, are like the rains that refresh the fields; the prosperity of his reign, his meekness and greatness are like the clear, bountiful, and lovely autumn; the recital of the virtues of Sita, that jewel of faithful wives, is as the undefiled and excellent water; the amiability of Bharat as its unvarying coolness. Although Bhawani did not speak out, Mahadev can read the heart and knew her thoughts, and said: Listen to me, Sati; you are just like a woman; but you should not entertain these doubts; this is that Rama, my special patron, whose story was sung by the Rishi Agastya; in whom I exhorted the saint to have faith, and who is ever worshipped by seers and sages. He, the heavenly king, detected the deceit; for he sees all things alike and knows the heart, the all-wise lord Rama, the very thought of whom disperses error. Yet even him Sati attempted to deceive — see how inveterate woman's nature is. But Rama acknowledging the effect of his own delusive power, with a sweet smile and folded hands saluted her, mentioning both her own name and that of her father, and added where is Mahadev, and why are you wandering alone in the [[w:Forest|forest? The anguish of my heart is beyond words, but I take comfort when I remember Rama, whom men call the lord of compassion, and whom the Vedas hymn as the remover of distress. Him I supplicate with folded hands. May this body of mine be speedily dissolved. As my love for Shiva is unfeigned in thought, word, and deed, and as his word cannot fail. From the day when Sati's spirit left the body he [Shiva] became a rigid ascetic, ever telling his beads in Rama's name, and attending the public recitations in his honour. None is so bold but Love steals his heart, and only they whom Rama protects can then escape. Then Shiva, after bowing to the Brahmans, took his seat, remembering in his heart his own lord, Rama. Then the sages sent for Uma, who was brought in by her handmaids, richly adorned. All the gods beholding her beauty were enraptured. ... to whom Gauri's lord is dear as life. He who loves not Shiva's lotus feet can never dream of pleasing Rama; a guileless love for Shiva's feet is the surest sign of faith in Rama. For who is so faithful to Rama as Shiva, who for no fault thus left his wife Sati and made a vow, the pledge of unswerving fidelity? And whom does Rama hold more dear than Shiva? Vision of the true faith. They utter doctrines repugnant to the Veda, with no understanding of loss or gain; their glass is dim, their eyes are naught; how then can such hapless weights see the beauty of Rama? First I will relate the manner of their exalted converse, after which you shall hear of Rama's incarnation and his all-glorious and sinless deeds. Hari's virtues and names are infinite, and his history and his manifestations beyond number or measure. This then was the cause of one birth and the reason why Rama then assumed a human form. Each avatar has its legend, which the poets have sung in various ways and according to tradition. On one occasion it was Narad's curse that caused him to be incarnate. Intoxicating liquor was the demon's share, and the poison was for Mahadev; but for yourself Rama and the Kauntulha jewel. You have ever been selfish and and perverse and treacherous in your dealings. ... Energy, queen of beauty, mother of the world; of whose members are born countless Umas and Ramas and Brahmanas, all alike perfect; by the play of whose eyebrows a world flashes into existence, even Sita, enthroned at Rama's side. Shameless, pitiless, and ever bent on mischief, the ten-headed miscreant [Ravana] thought to conquer Rama. Hearken, Bharadwja; if god is worth with a man his diamonds turn in bits of glass that are not worth a cowry. Auspicious was the conjunction of the planets in an auspicious house; auspicious the moment; auspicious the day of the week and of the month; and full of delight was all creation, animate and inanimate, when Rama, father of delights, was born. There was not one who observed the strange event, and at last the sun set, still chanting Rama's praises. The gods, saints, and Nagas too, who had witnessed the spectacle, returned home congratulating themselves on their good fortune. One day his mother, after washing and dressing him put him to sleep in his cradle. When the service was over and she had made her oblation, she returned to the place where she had dressed the food; but when she came there she beheld Rama in the act of eating. In a great fright she ran to the nursery and there found the child again sleeping; but coming back once more she still saw the baby. Then she trembled and was much disturbed in mind for she saw two children, one here and one there, and was utterly bewildered, saying, Are my own senses at fault or is something else the matter? When Rama saw his mother’s distress he broke into a merry laugh. Sita...wearied with gazing upon Rama's charms, her eyelids forgot to wink, and her whole frame was fulfilled with desire, as is the partridge when it sees the autumnal moon. Receiving Rama into her heart by the pathway of vision, she craftily closed upon him the doors of her eyelids. When her companions saw her thus overcome they were too much abashed to utter a word. Earth, hell, and heaven were pervaded with the glad news: Rama has broken the bow and will wed Sita. The men and women of the city light votive torches, and, regardless of their substance, scatter gifts in profusion. Sita by Rama's side was as resplendent as if beauty and love had met together. Her companions whisper: Embrace your lord's feet; but in excess of fear she dares not touch them. Next came Viswamitra to salute him, and placed the two boys at his feet, saying : "These are Rama and Lakshman, Dasarath's sons." He admired the well-matched pair and blessed them, with his eyes long fixed upon Rama's incomparable beauty, which would humble the pride even of Love himself. Worship him, says poor Tulsi Das, and cease from all wrangling and hypocrisy. Rama and Lakshman accompanied the saint [Vishvamitra] to the world- purifying Ganges. Both the lord and his younger brother reverently saluted it, and Rama was delighted beyond measure, as the son of Gadhi (Vishvamitra) told him the legend how the heavenly stream had come down to the earth. Rama smiled to himself on hearing this. "They are the sons of Dasarath, the glory of the line of Raghu, and the king has sent them to help me. Rama and Lakshman by name, these two brothers, as strong as they are good and beautiful, with their companions, protected my sacrifice and vanquished all the demons in battle. ... Sita was more glad of heart than words can tell ; and as an auspicious omen, her left side, the seat of good fortune, began to throb. The two brothers returned to their Guru, inwardly praising Sita's loveliness ; and Rama related all that had taken place, being simplicity itself and utterly devoid of all guile. Wherever the two gallant princes turned, all men's eyes were dazzled ; each saw in Rama what he himself most admired, nor did any one comprehend in the least the special mystery. The saint [Vishvamitra] told the king [Janaka] the arrangements were perfect, and the king was thereby gratified. [Royal Announcement] Here is now the great god's massy beam, and whoever in this royal assembly shall to-day bend it shall be renowned in heaven and earth and hell, and at once without hesitation shall receive in marriage the hand of the king's daughter [Sita]. With flushed face and many a close look, they essay the divine bow; but though they put forth all their strength in a thousand different ways, they cannot move it. Those, indeed, who had any sense at all did not go near it. When w:JanakaJanak]] saw the kings thus dismayed he cried aloud as it were in anger: "Hearing the vow that I had made, may kings have come from diverse realms, with gods and demons in human form, stalwart heroes staunch in fight. A lovely bride, a grand triumph and splendid renown, but God it seems has not created the man who can break the bow and win it. Yet at last, bowing his head at Rama's lotus feet, he thus spoke in dignified tones: " May there never be repeated in any assembly, where even the lowest of the family of Raghu is present, such a scandalous speech as that now uttered by Janak in the presence of the greatest of the clan. Ye elephant warders, ye tortoise, serpent, and boar, hold fast the earth with a will that it shake not, for Rama is about to break the great bow; hearken to my order and be ready." When Rama drew near to the bow, the people all supplicated the gods by their past good deeds. Parashurama, like Rama, was one of ten avatars of Vishnu. Here were rhapsodists chanting songs of praise; here were Brahmans muttering Vedic spells; while lovely women carolled joyous songs, ever dwelling on the names of Rama and Sita. The joy was so great that the palace was too small for it, and it overflowed on all four sides. Hearken, Rama; whoever it was who broke Shiva's bow is as much my [Parashurama] enemy as was Sahasrabahu. Separate him from among the assembly, or else every one of these kings shall be killed." When Lakshman heard the saint's words, he smiled and told him in atone of contempt: I have broken many a bow as child, and your never before this angry; why were you so fond of this bow in particular? 'Parashurama' meaning "Rama with an axe" is appeased, recognizes the power of Rama, blesses him and goes away to the forest to continue his penance. Hearken, Rama; whoever it was who broke Shiva's bow is as much my enemy as was Sahasrabahu. Separate him from among the assembly, or else every one of these kings shall be killed." When Lakshman heard the saint's words, he smiled and told him in atone of contempt: I have broken many a bow as child, and your never before this angry; why were you so fond of this bow in particular? Said the son of Gradhi [Vishvamitra], smiling to himself : "Everything looks green to the saint's eyes; though Rama has to-day broken the bow as though it were a stick of sugarcane, still he has not the sense to understand. As Bhrigupati [Parashurama]] heard his fearless words, his whole body was on fire with rage, and he became quite powerless and in a tone of entreaty cried to Rama: " See if you can manage this little brother of yours; so fair without and foul within, he resembles a golden jar full of poison. The king made obeisance before Viswamitra, saying : It is by my lord's favour that Rama has broken the bow. These two brothers have given me the victory: tell me now, reverend sir, what it becomes me to do. Said the saint : "Hearken, wise king; the marriage was dependent on the bow, and took effect directly the bow broke; this is well known to every one, whether god, man, or Naga. Who, 0 king [Dasharatha], can be more blest than you, who have a son like Rama? nay, four heroic sons, all equally obedient, religious, and amiable. Happy indeed are you for all time. Prepare the marriage procession to sound of music. Rama alone recognized the influence of Sita, and rejoiced at this proof of her love. When the two brothers heard of their father's [Dasaratha] arrival they could not contain themselves for joy, but were too modest to speak to their guru, though they longed greatly their sire again. The lovely images of Rama and Sita were reflected in the jewelled pillars, and sparkled like incarnations of Kamdev and Rati, who had come to witness Rama's glorious weddings, and, from mingled curiosity and bashfulness, at one moment showed themselves openly and at another retired out of sight. Every good and auspicious omen was ready at hand for him whose glorious son was the incarnate god, for a bridegroom like Rama and Sita his bride, and the pious Dasarath and Janak, the two parents. When they heard of the marriage, all the good omens began to dance and say: "Now at last the Creator has made us to be what our name denotes". Seeing the auspiciousness of the time, the deities rained down flowers and beat their drums. Shiva and Brahma and all the host of heaven mounted their chariots and came in crowds to see Rama's wedding, their heart and every limb throbbing and quivering with excess of love. They were so charmed with Janak's capital that their own realms seemed to them as nothing worth. After the lustral rite and the oblation Rama proceeded to the pavilion. So great was the splendour and magnificence of Dasarath and his retinue that Indra was put to shame by it. From time to time the gods rained down flowers, while the Brahmans repeated the appropriate propitiatory texts. When he saw the gods the all-wise Rama assigned them what seats they fancied; and the heavenly powers were delighted to behold the gracious manner of their lord. As the partridge drinks in the light of the moon, so their eyes reverently drank in the beauty of Rama’s face with the utmost rapture. With their own hands the glad king and queen take and place before Rama golden vases and costly jewelled trays full of holy water and delicious perfumes. The saints with auspicious voice recite the Veda, and at the proper time the heaven rains flowers, while the father and mother of the bride look on in rapture and begin to wash the holy feet. Then came the joyous Rama, the glory of the Solar race, with his brothers to Janak's palace to take leave. All the people of the city, whether men or women, ran to see the four brothers so lovely and so unaffected. Courteously the king dismissed the burglars and reverently bade all the mendicants and approach and bestowed upon them ornaments and clothes and horses and elephants, and affectionately cherishing them made them stand up before him. After again and again reciting his praises they turned home with Rama in their heart. O Rama! I command you to clear this region of Tadaka's interference. I desire that this region regains its past glory and becomes truly free from all troubles. That fearsome witch has wrought great damage to this area with her reckless exploits. - Vishwamitra. Taking this opportunity, Rama promptly used his Agneya Astra and aiming it at Subahu's chest, ended his life. On completing his yagya when Maharshi Vishwamitra saw that Rama had killed all the demons, who used to disturb his yagya, he was thrilled. Saint Agastya presented Rama with the bow made by Vishwakarma. This bow was made of gold and studded with diamonds. Along with this, there were two quivers gifted by Indra, which never became empty. He also gave Rama a golden sword. While handing over all these weapons to Rama, Agastya said, “Kindly receive these as gifts. These will help you in gaining victory over the demons. Akampan told me that this Rama is a very powerful man and possesses divine qualities. It may not be possible to defeat him in personal battle. Hence, I have decided to deceive them first through magic and then abduct his wifeSita. -Ravana. ...Master! I am Ravan’s younger brother. I have come to seek refuge with you after being oppressed and insulted by him.Kindly accept me as your servant... - Vibhishan. S.P. Bansal in: Lord Rama, Diamond Pocket Books Pvt Ltd, 22 October 2014Issues covered in earlier sections have been excluded here. Of all the boys, Rama was the brightest and the most valiant. He possessed the gift of soothing everyone's heart like the spotless moon. Rama was highly skilled in the art of archery and was constantly engaged in perfecting this art through practice. Rama was also a filial son. A major portion of my yagna has been completed. However, feeling threatened, demons like Maarich and Subahu are hell-bent on disrupting it in its final stages...Hence, O King [Dasharatha], I request your help for the protection of this Yagna [Siddhiyagya]...Hence, O King! I request you to press your able, brave, eldest son [Rama] into my service for a few days...In return for his help, I will bless him with the knowledge of Pashupatastra and several other weapons. O, Muni!, after an agonizingly long wait, these sons were born to me in my old age. In addition, Rama being the eldest of my sons, is especially dear to me. Further these Rakshasas are very able too – in addition to being physical giants. My concern is how an ordinary human like Rama be able to face them. Do not doubt Rama's ability to fight the demons. I will train Rama personally in the art of breaking through the spells and magic of the Rakshasas. I will transform him into an exceptionally able warrior. When I myself am feeling incompetent to fight these evil souls how can the young boy Rama stand up to him? Moreover he is not that familiar with skills of warfare. He is too young right now. Hence, I am fearful for his safety and security. Lakshman was like Rama's shadow; hence it was sure that he would follow Rama whenever he went. Standing in the royal assembly, Rama could read worry written on his father's face. But he also knew that his father had won over himself. He had succeeded in showing preference for his dharma over affection for his son. Rama rejoiced over this fact. Just as Ashwini Kumars walk behind Brahma, in the same way, the two brothers Rama and Laxman gracefully followed the Muni [Vishvamitra]. Dearest Rama! Kindly wash yourself now with the water from the River Saryu. After that, receive this holy mantra in the name of Bala and Atibala. The effect of this mantra upon you would be extraordinary – you would never experience tiredness or illness and there would be no distortion in your appearance. Even when you are asleep or in a state of inattentiveness, the Rakshasas won’t be able to harm you. No one on this earth would be able to stand up to your strength. O Rama! I command you to clear this region of Tadaka's interference. I desire that this region regains its past glory and becomes truly free from all troubles. That fearsome witch has wrought great damage to this area with her reckless exploits. ..and, all these weapons immediately presented themselves before Shri Rama and folding their hands, addressed him, "O ever generous Raghunandan! May you be blessed. Consider all of us your slaves. We are fully prepared to give. Maharishi Vishvamitra narrated to them the story of Ahalya and Indra. The amorous Indra deceived Ahalya and raped her. When Muni Gautam came to know of this he cursed Indra to become hundred eyed and cursed Ahalya to survive on air and and lie in ashes for thousands of years. O, Rama! This is the forlorn ashram of that accursed Ahalya. Now that you have arrived here, I request to bless Ahalya and release her from her curse. On entering the ashram Rama came across Ahalya engaged in deep meditation. Ahalya was invisible to both humans and devas. Rama was the only person who could see her in all the three worlds. On seeing Rama, Ahalya's curse ended. Now she became visible to everybody. Recalling Maharshi Gautam's words, Ahalya received the princes with great affection. Ram accepted her hospitality wholeheartedly. With her powers of meditation Ahalya regained her true appearance. She was reunited with Maharishi Gautam with the intervention of Rama. Rama has proceeded to the forests and now Bharat is heir apparent to this kingdom. However, I doubt whether I would be able to live long enough to see Bharat's coronation. Kaikeyi was in a predicament. It now seemed to her that she had made a big mistake. She felt that sending Rama into exile for fourteen years was probably too bitter and tough a condition. Advancing thus [in his exile], Rama came upon a kingdom, known for its prosperity. Here, he had a vision of goddess Ganga. How attractive was this place! In the waters of river Ganga, the Devas took holy dip. A king named Guh]] ruled over this region called Shrigaverpur. He was a devotee and fast friend of Rama....When Raja Guh that Rama had entered the boundaries of his kingdom , he was delighted…rama rejected the royal welcome extended to him by Guh and proceeded to rest under a tree on a mat of mere straw. Sumant [he had been ordered to back by Rama] had witnessed Rama's every stage of growth. Today, he was watching the same Rama go off into exile, but he also had no powers to redeem the situation. He, too, was bound by his commitments. This was Rama's first day outside his kingdom without Sumant. Maharshi Bhardwaj was sitting with his disciples, after completing his yagna. Rama, Laxman and Sita greeted him and touched his feet. Rama said, "O great Muni! This is my younger brother Laxman. This is my wife Sita and I am Rama, Dasharath’s son. In obedience to our father’s command we have come to the forests. Ravana: It seems that Rama has come to Janstana accompanied by the might of all Devas and Devraj Indra. Akampan: No Maharaj! Rama lives alone, accompanied by his wife and younger brother. Akampan: Don’t be agitated , O King! No one can defeat Rama. He has the power to prevent the earth from sinking into the ocean; he can stop the flow of a mighty river by his arrows; he can destroy all the inhabitants of the earth in a moment and create a new universe. It is my estimate that all the combined might of the Devas and the Asuras cannot destroy Rama. But Maharaj I have an alternate plan...You can deceive Rama through magic and abduct Sita. Akampan told me that this Rama is a very powerful man and possesses divine qualities. It may not be possible to defeat him in personal battle. Hence, I have decided to deceive them first through magic and then abduct his wifeSita. Vibhishan, concerned for his brother's safety, summoned up courage and said to [[w:Ravan|Ravan, "My respected elder brother and king of Lanka! It is the height of folly to show enmity towards those who have amply displayed their prowess by hurting Surpanakha, killing Khar, Dhhosana, Maarich and by destroying the entire army of demons. I suggest that you return Rama’s wife to him. Ravan, greatly angered, said, ”If any one else had uttered these words I would have put him to death. It is in your interest to go away from here. Rama said, "Hanuman had told me about Vibhishan on returning from Lanka. This is the right occasion for him to come here. He has sought the company of good by dissociating himself from evil influences. Hence, we should welcome him. I, for one, will not reject him under any circumstances. On receiving Rama’s signal, Vibhishan descended from the skies, fell at Ram’s feet, wept and said “Master! I am Ravan’s younger brother. I have come to seek refuge with you after being oppressed and insulted by him. Kindly accept me as your servant. Maharaj! Through Brahma’s blessings, Ravan is protected eternally from the attacks of the Devas, Gandharvas, Yakshas and Asuras. Our middle brother, Kumbakaran, is also mightily blessed. Ravan’s Commander-in-Chief, Prahast, had defeated Kuber’s commander, Manibhadra, in a battle at [[w;Mount Kailash|Mount Kailsah. 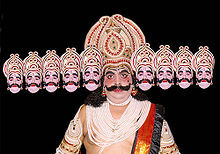 Ravan’s eldest son is named Meghnad Indrajeet. He knows the art of vanishing on the battlefield, confusing his opponents. Overwhelmed with emotion, Rama brought some water from the ocean and crowned Vibhishan as the future king of Lanka. When the issue of crossing the ocean was raised, Vibhishan said, "Rama! For this, you will have to ask the ocean itself to show you a way. After reaching the enemy's territory, Rama and his supporters were making consultations with each other as regards the course of action to be taken. Vibhishan showed the topography of Lanka to Rama from the peak of Mount Subet. Shouting sky-rending slogans praising Rama, these monkeys descended upon the demons with all their might. Rama was stationed, along with Laxman and Sugreev, at the northern gate. They were accompanied by one crore [ten million] monkeys. Along his journey Rama freed Ahalya from her curse. The grace of God is so strong it can free us from the most difficult situations. Through it our inner wisdom, symbolized by the sage's wife, can be released from the stone of ignorance and materialism in which it is trapped. But for this to occur, we must open ourselves to the Divine Will. Otherwise obstacles will arise that we cannot possibly overcome by our power. in their travels to the south. the yearnings of the heart are naturally fulfilled. Lava and Kusha, now grown, visit the court of Rama. Long-estranged associates or kinsmen appear with important new tidings and knowledge or old events. One's children or proteges will gain honor and recognition. From its first success, the book became treasured by devotees of Rama and its fame spread throughout the country. Many people in India still use it today. The Tulsidas Ramayana itself can be used as an oracle. There are various methods of selecting verses from it to answer questioners. Knowledge, wisdom will come to you on Wednesday. the protector of the sages' holy practices, then give up all fear. This action will protect you from all evil and sorrow. evil kings were filled with envy and jealousy. Virtuous kings were overjoyed in their hearts. occurred in all parts of the city. Good omens were as abundant as trees in the forest. on the great forest trees. served them with love and care. This sign is both good and bad. and one turns into the other. ...to the narration of the Ramayana with Hanuman still in Lanka having to fight his way out of the city. He returns across the sea and helps Rama prepare his forces for the coming battle. according to the most sacred rites. when peace dwelled on Earth. Of all verses, this is the foremost to give triumph and success. Rama, representative of the Divine is established as the king of the world. The Divine Will is again honored by people, which brings peace and blessings. Lava and Kusha, now grown, visit the court of Rama. Long-estranged associates or kinsmen appear with important new tidings and knowledge or old events. One's children or protégés will gain honor and recognition. We are encouraged to action on these days much life at the beginning of the oracle, but here the results are more certain. Rama, Lakshmana, Bharata and Shatrughna. profit, love, and all good fortune. and upon Sita, Rama, Lakshmana, and Hanuman. This is the way to the oracle. Ram's calm repose in the face of all adversity, so evident in the Ramayan, has made him worthy of veneration, adoration and worship. Ram's story has reached the masses not through erudite Sanskrit texts but through theatre song and dance performed in local languages. All of these retellings of Ramayan have their own turns and twists, their own symbolic outpouring, each one valid in their respective contexts. The Ramayan, one of the most revered texts in Hinduism, tells the story of a prince called Ram. Dashrath, king of Ayodhya, had three wives but no children. So he conducted a yagna and invoked the gods who gave him a magic potion that was divided among his three queens. In time the queens gave birth to four sons. Ram was the eldest, born of the chief queen, Kaushalya, Bharat was the second born to Dasharath’s favourite queen Kaikeyi. Lakshman and Shatrughna were the twin sons of the third queen Sumitra. The twentieth century saw Ram on celluloid with films like Bharat Milap (1942), Ram Rajya (1943 film) andSati Sulochana (1961). Ramanand Sagar's television serial Ramayan, with Arun Govil starring as Ram, made history in the late 1980s. The Ramayan also happens to be part of the Mahabharata, dated between 300 BCE and 300 CE, where it is called the Ramopakhyan. When the Pandavas bemoaned their thirteen years of forest exile, Rishi Markandeya retorted by telling them how Ram suffered for fourteen years and while the Pandavas deserved their punishment for gambling away their kingdom, Ram did not deserve his fate – he was simply obesing his father. Later, wandering in the forest, Rama and Lakshmana come to the grove by the Pampa Lake. It is Spring and Rama and Laskhmana bathe in the crystal waters of the Pampa ablaze with white and red lotus buds. The trees are proudly crowned with flowers along the banks and long creepers fall from them laden with blossoms. Screaming parrots make shrill music and Rama feels his whole being filled with languorous desire for Sita. The Ramayana is an epic poem of love and beauty and tells the story of the princely hero, Rama, who fights a battle to bring back his kidnapped wife, Sita, from the demon king of Lanka (Ceylon). Valmiki's Sanskrit poem Is filled with lyrical descriptions of Nature. Rama and Lakshmana are tricked into leaving Sita unprotected in the forest and when they return they find her vanished. She has been kidnapped by Ravana. Rama, in his despair, runs madly from thicket to thicket calling Sita's name. In each ray of sunlight, in each golden flower, he thinks he recognizes her yellow robe. Somewhere under alien skies it must be Spring too, and my imprisoned love mourns for me. My spirit knows she can never live without me. Every gentle breeze that stirs the blossoms on the trees fans the fury of my desire. Where are you, Sita, my fawn-eyed love? One of the dramatic episodes in the Ramayana is the abduction by Ravana, the demon-king of Ceylon, of Sita, wife of Rama exiled in the forest. Rama is lured into the forest in pursuit of a deer (a demon in disguise), and his brother Lakshmana, guarding Sita, is tricked into leaving her. Ravana then appears, sweeps Sita off in his aerial chariot. A great vulture, Jatayu, tries to rescue her and though mortally wounded lives long enough to tell Rama of Sita's abduction. Ravana woke to a new day to the strains of music as the solemn hymn of praise to the dawn was sung. The thought of Sita came to his heart, he could not control the passion that absorbed his soul. Laying aside his bow and arrow, he put on a spotless white robe embroidered with flowers and gold and entered the Asoka grove impatient to see her. A sudden fear and trembling took hold of Sita when she saw Ravana in his pride; she folded her arms' over her breasts trying to screen their beauty from his bold and amorous glances. She lay prone like a severed branch on the earth, her thoughts flying to Rama to give her courage. Valmiki's Ramayana has Ravana as the villain, but in South India and the Jain versions, Ravana is the great tragic figure for his love for Sita carries with it his own death; he catches our imagination and the idea that his passion bears its inevitable disaster follows the spirit of Greek tragedy. The first non-Indian version of the Ramayana was produced in Chinese and dates from about the fifth century. In Tibet, Nepal and Chinese Turkestan local versions appear to be well known from about 700 A.D. In Cambodia an inscription dated 600 A.D. tells that a sage presented the Ramayana to a temple and made arrangements for its recitation. We know that in the tenth century a Sanskrit scholar expounded both epics at the Cambodian court. The Ramayana has a special place in India and South Asia because of the purity of Rama and Sita and their love symbolizing fidelity. The ideal of chivalry in the epic corresponds to that of Europe in the Middle Ages, for Rama is the protector of the oppressed, of widows and orphans; he is the perfect knight valiant in face of danger, protective and tender to all women while loving Sita alone. Many scholars have frequently found comparisons between Homer's Iliad and the Ramayana for they share the basic plot of a husband who goes forth to battle to rescue a kidnapped wife; and the story of Jatayu, the vulture, whose brother burnt his wings on going too near the sun recalls the [[w:Greek myth|Greek myth of Icarus. Many other characters in the, Greek and Indian epics have points in common: Agamemnon and the monkey king Sugriva, Hector and Indrajit, the son of Ravana who abducted Sita, Nestor and Hanuman. Other details recall the Bible: Hanuman and Joshua both order the sun to stop in its course; and Hanuman, like Jonah, enters the mouth of a sea monster. The three colossal figures dwarfing the ordinary mortals at their feet are pasteboard effigies of the principal demons of the Ramayana ten-headed Ravana flanked by Meghdana and Khumbhakarna. They figure in the celebration of the Indian festival of Dusserah. After celebrations dedicated to the Goddess Durga who helped Rama against Ravana, giant effigies, erected in a northern Indian cities, meet a fiery fate when flaming arrows shot by Rama ignite explosives packed inside them. This page was last edited on 20 February 2019, at 02:40.